I am not interested in becoming a fashionista… that’s just not me. My lifestyle is casual, practical & comfortable. But, with an upcoming trip to the mainland and no winter clothes (I live in Hawaii), I needed several basic wardrobe pieces that could be put together in a Wardrobe Capsule. This will allow me to pack a few interchangeable items without buying a ton of clothes. Last month, I turned to Stitch Fix for help, and posted my tips on How to Get a Better Stitch Fix after keeping all 5 items they sent. This month my goal was to have Stitch Fix build on the outfits they sent me & they hit another Home Run! With this Fix, I requested my same stylist ‘Jeni’ to pick out items that would coordinate with my last Fix. I gave suggestions for items I wanted and made it very clear that I wanted to build a Winter Wardrobe Capsule. Black Cordelia Stretch Skinny Jeans – $78 (kept): LOVE these Skinny Jeans! Grey Sam Hi-Lo Short Sleeve Top – $44 (kept): Loved the way this shirt fits. Black Queensland Dolman Jersey Top – $48 (kept): Dolman style tops are my favorite & this one is so comfy. Light Grey Harstad Quilted Puffer Coat with Hood – $118 (kept): I’m counting on this jacket keep me warm while traveling. I also like that the hood is removable & the waist can be cinched to flatter your shape & keep the cold out. Dark Brown Michael Faux Leather Jacket – $78 (kept): When I first pulled this jacket out of the box, I didn’t like it. But after trying it on, I realize it worked nicely with the jeans & tops I had. Plus, with the 25% discount Stitch Fix offers when you keep all 5 items, it actually was cheaper to keep it then to send it back. There’s not much color going on, but I did specifically requested basic interchangeable pieces so I can use scarves, sweaters, boots & accessories to bring in a pop of color & change up my look easily. My personal style has been ‘Jeni’. She has done a great job working with my requests & I will definitely be asking for her again. In addition to using Stitch Fix , I LOVE thrifting for other basics & accessories at ThredUp.com I’ve found scarves, shoes, boots (even a pair of UGGS!) for a fraction of what you’d pay new online. If you never tried ThredUp, here’s a $10 coupon off your first order. 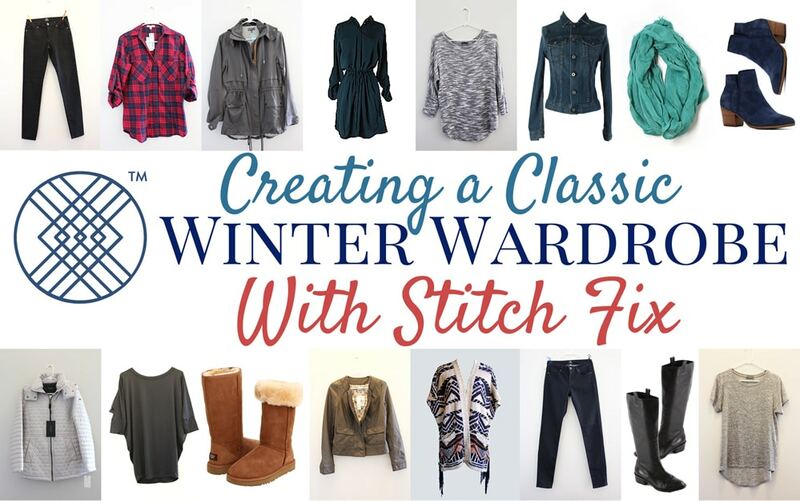 Have you tried building a Wardrobe Capsule? If so, I’m curious to know what pieces you think are the most valuable & the ones you wore the most/least? Not sure what a Wardrobe Capsule is? Here’s a great explanation over here.